If you are in need of any new folders for your cabinets, there is a much quicker way to add folders when using the Browse Folders search under Locating. 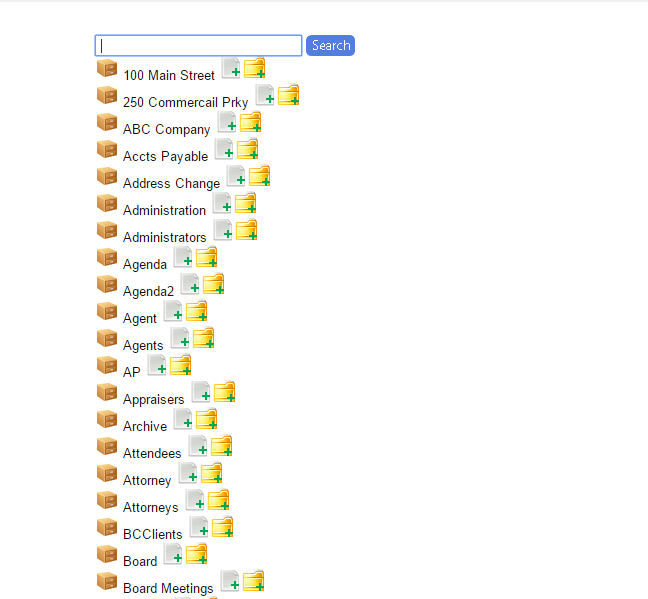 From the Browse Folders screen Menu>Locating>Browse Folders, simply click on the folder icon next to the cabinet you would like to add a folder to and fill in the metadata then save and exit. Workflows can now be set up for a delayed start rather than the moment a document hits the system. From the Document Type setup screen, instead of choosing your workflow under “Workflow”, select your workflow under “Delayed Workflow” and choose an amount in days for when you would like the workflow to begin. This will be the number of days after the entry date before the system will begin the workflow for that specific document type. The ARIE Queue screen displays all present and past ARIE Requests. There are several requests that ARIE can do for you behind-the-scenes, which include OCR, Viewable Images, ARIE Batch, ARIE Single, ARIE Multiple, ARIE Native, E-Sign Requests, Cover Pages, Merging and Variable Naming. The ARIE Queue is only accessible through the ‘admin’ account. Click the Fx button in the same column as the ARIE Request you want to mark as a “High” priority. Click Change Priority, then change the priority to “High” and Submit (To change the priority for multiple process at once, select all you want to change the priority for, then use the Fx button above the “Action” checkbox). Change the Status column to “Failed”, then click Search above. Click the Fx button in the same column as the “Failed” ARIE process you want ARIE to re-run. Click Change Status, then change the status to “In Queue” and Submit. Click the “Action” checkbox to select all “Failed” ARIE processes. Click the Fx button above the “Action” checkbox. Click the Fx button in the same column as the ARIE Request you want to delete. Click Delete Request (To delete multiple ARIE Requests at once, select all you want to delete, then use the Fx button above the “Action” checkbox). Please NOTE: Performing this function will not delete any actual documents. While on the ARIE Queue screen, you can only delete particular “ARIE Requests”. ← What is Document Management?